Reported here have been a ghostly priest, a ringing bell, strange noises and footsteps, and mysterious mists. The bell is said to be from a phantom church, which used to stand nearby but was burned down a few decades ago, reports say. Some say the church basement was used for devil worship, leading to the dangerous paranormal activity here. I went to that church as a child and it was certainly was not scary. I sang in the church choir, helped my Mom clean and enjoyed many parish picnics there. There used to be a church hall as well and the adults would have card parties there.. The only reason it gets this scary connotation is that some stupid kids went in there and were wreaking havoc. My relatives are buried there so I wish everyone would just leave the place alone. I know where a much scarier place is near there where there are graves that are probably from the wagon trail days. There were 3 of them and the names were written on flat rocks. I surely won’t tell where it is located as some idiot is likely to go there. Well, somebody’s having a bad day.. ;P and yes I would still go there for the possible paranormal experience. As long as you’re not wrecking any tombstones or damaging graves it’s not doing any harm. So stop. Church did NOT burn down a “few” decades ago. Mabey 10 or 11 years ago. Sorry. The fire department burned it down for practice. People are crazy. Just making stuff up. It was long condemmed before burning. Wiji board was brought there.. I walked through there at night and heard footsteps and a bell ringing and a chain rattling. Definitely something going on there! I say it can be dangerous but not unless I go there my self and see if there really are evil spirits that are truly evil. Than I will. Not being a jerk or anything. But they say dangerous to make it more scarier. Don’t you guys think. Yeah … This place burnt down 10-15 years ago before it was condemned in the late 1990s it was a little food co-op that only lasted for a short time cus of its location . Before it was the co-op it was owned or used by a satanic cult . They would do black mass rituals there as well as sacrifice animals and do soul hunts in the grave yard . I know this cus I was a local and some friends of mine attended and I went a few times. The area had a small group of witches that had bought farms and old houses .. I don’t think they live around there anymore . But in the 90s. Satanic rites and rituals were preformed there and all around lake Geneva and weird random spots in sconie . Satan was all the rage in the 80s and 90s … Now he just runs the world . check shadowlands for the update from years ago. that was my update. The church before it was burned down as a training exercise was used for satan worship. I had first hand witnessed it. The phantom bell is coming from a house in the distance at someones house. The smell is coming from the stagnant wetland swamp in between the cemetery and the homes. The only paranormal activity witnessed was a strange mist that disappeared when approaching and a shadow that moved from tombstone to tombstone. The jesus statue doesn’t cry or bleed. that’s a urban legend that has no basis in fact nor has it ever been witnessed or photographed. The cemetery itself has some paranormal activity but not much. It’s not worth the time. There is another cemetery in lake geneva that is very haunted near the high school. Saint Killians has many legends associated with it. Very few are actually true. Do not get caught in there the police will ticket you. Nate, where is the cemetery by the high school? I was here recently with my kids filming in slow motion and capturing images at a slower fps. My kids and I looked through the pics briefly manifesting a few possible ghost images that were not real. It wasn’t until I was glancing through the photos last night that I clearly saw some things we missed. 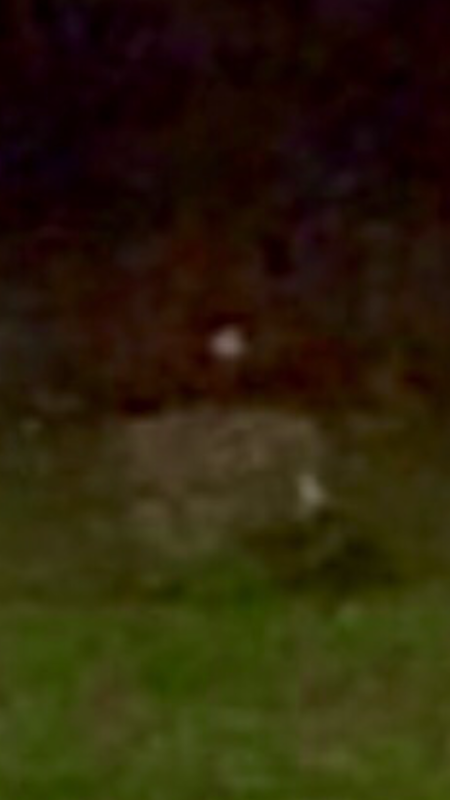 Two headstones appear to have faces and another more disturbing image that appears to be a collage of a man’s face, a woman in white, and the head of something else, clearly not human but definitely a head. If anyone reading this has similar pics from this cemetary please contact me, I am very serious and slightly freaked out. My phone won’t allow me to post them here for some reason, but I’d gladly share them with serious legitimate interested parties. My father actually had a paranormal experience here. He was parked in drive before the fire dept burned the church down and was waiting on my uncle who lept out to pee somewhere over there. He saw a man in his rearview mirror and as soon as he looked away, the man came to his side mirror. He could only see him, when looking in the mirror. Super creepy! I live just outside of Lake Geneva and have passed by many times. I’ve heard the Satan worshiping stories, but never noticed anything paranormal. I’ve also heard stories from some of my neighbors about going to church there as little kids. I’ll probably talk to some friends who live closer to the cemetery.